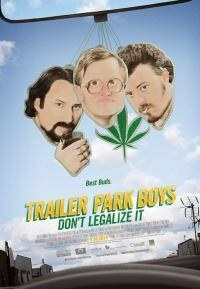 Canada's Trailer Park Boys have become a comedy institution in its own right, and with the stoner-ready release of Don't Legalize It -- their third film -- Bernard Robichaud tells us about the filming, his fitness, and tossing joints in the trash. Bernard Robichaud may be best known for his role on the Trailer Park Boys movie and series as Cyrus, the antagonist to the Ricky, Julian, and Bubbles protagonists. Cyrus is back in both the new season and the new movie (Trailer Park Boys 3: Don't Legalize It slated for a release on -- you guessed it -- 4/20) and has teamed up with another villain in the cast, Sam "Caveman" Losco, for double trouble for the boys. PopMatters had a chance to speak with Bernard Robichaud over the phone before the holidays, and he filled everyone in on the lowdown on the set of Trailer Park Boys, the best ways to stay fit, current and upcoming projects (such as a double appearance on Jason Priestley's Call Me Fitz holiday special), and his metaphor for a chain link fence. You and Sam are teaming up as the villains in the new movie and the new season. How did you get together? Well, you know, Sam and I were originally together in Season Two, I believe. He had some issues with the boys, and I did as well ,so that was the first time we teamed up. How we got together again wasn't really the issue but whether or not Mike Clattenburg saw it as something he wanted to do with the movie. Of course after the boys bought the rights to the show, it was an extension from the movie to some degree, so it made sense to keep us together. Are you allowed to talk about why Trevor didn't return for the movie or new season? I think, from what I understand, Michael Jackson [Trevor] was very interested in coming back. He was totally booked with other commitments during that time we were shooting Season Eight, so that prevented him from joining us. That was the reason. I'd like to think that he might return for Season Nine. I noticed that in the new season there are several different directors, including a couple of different cast members. Did you have favorite you worked with? Well, Cory Bowles ["Cory"] did some directing. Cory and I, of course, go back to Season One, and so it was fun to work with the quite talented and gifted man. Working with him, he's brilliant. Jon Dunsworth ["Mr. Lahey"] directed one as well, and again, Jon is brilliant as well; [he's] quite a gifted actor in his own right. I was very happy to work with Jon; he's a very giving man. We also worked with Jay Baruchel (This Is The End, Knocked Up, Undeclared), another brilliant actor. [He] knew exactly what he wanted when it came to directing. The experience was nothing bad, it's [just] two different things. You've got Mike Clattenburg, who was the intiially the creator and one of the most gifted men i've known. So, you know that's gave Trailer Park Boys its length anyway; there were a lot of gifted out together and made a good team. The three boys themselves [Rob Wells, John Paul Tremblay, and Mike Smith] are gifted and had the foresight to be able to choose great ppl to push the new season and direct it. It sounds like you can't really compare them, that they are all good in their own ways. Yeah, but they're all brilliant and genius in their own right. Did you film in same trailer park as you have done previously? No, we didn't. We filmed in another trailer park outside Halifax in town called Truro. It was a great setting in my opinion. It was everything I expected and more. I'm not sure why we didn't use it before. It was far enough away so that we wouldn't have had the crowds we had when we were shooting in Halifax, just enough to keep it trailer park-esque. Did you draw from personal experience in formulating Cyrus' character? Quite a bit of personal experience goes into Cyrus. Not just mine but experiences with other people I grew up with. It all kind of goes into the creation of Cyrus and how I portray him. I get some direction, too, of course. If it's not enough then, of course, I give them what they want. But the character itself in my opinion is a little bit of me and a lot of some people I grew up around. So you've never had any run-ins with the law? Never, no. I was a straight-laced athlete and played competitive hockey and basketball. That was my thing, and I never had that problem. The opportunity was there in the neighborhood I grew up in, but sports kept me out of that. Certainly some of the friends and mentors I had when I was involved in athletics [go into the character]. I often use the analogy of I was playing hockey: the chain link fence was that little grey area [while] my friends were out in the parking lot stealing stereos. I knew who they were, and they were friends of mine. But they chose a different route and you could see what they were doing - the chain link fence is transparent. It's possible to hop that fence but it's up to you to make the choice. And I chose athletics instead of the stereos. Nice. It's always a good idea to keep your nose clean. Sounds like it's worked out for the best. Are you a family man now? Does she like watching you on television or is she not allowed? She'll be 18 in January. I prevented her from watching it when she was younger, but I found out that a lot of her friends were watching it regardless. It was interesting to find that there were a lot of kids in that 10-11 age that were watching it. I guess it depends on the fam. I have been approached by mothers and fathers who wanted autographs for their kid and the kid would come. And I'd think, "Are you old enough to watch this?" I'm always kind of blown away. That's not to say that my daughter maybe might have watched an episode or two. I mean, we all have the internet and know how to work it. You can prevent them when they're under your roof, but when they go to friends' houses, it's hard to monitor what they're doing. She does think it's pretty cool what I do. There's no question about that. Do you ever get sick of people cursing at you and saying ines from the show? Ha, I kind of rolled with those punches a long time ago. It's pretty normal now. If you get upset about those things, I think you have to rethink your job. I dont think there's any way to prevent that. So you probably get offered a bunch of weed? I've had plenty of offers for contraband. But I don't smoke so I never really ... I've been given stuff, but I end up passing it to the next guy. I think you have to get rid of it; people are always passing me stuff. When I'm on tour, I choose not to smoke anything. I just give it away or toss it in the garbage. It's cool; that's your thing. It's not to say that I haven't, but I choose not to. It's not my thing, inhaling anything going to my lungs. For some reason, I don't want any of that. There's lots of things that are bad for you. I think things in moderation are probably okay; I just think it's part of staying in shape. It's difficult to get on an elliptical for 40 minutes and be a smoker at same time. I like the elliptical too; it's better on the knees and a perfect workout. It's not bad on knees. Because your arms are moving, you're pumping your heart. [Your heartrate] will get up faster than bike will [get it]. Probably rowing would be similar to some degree, but you're using your back more. You're still using upper body on the rowing machine. I'm sitting in my gym area as we speak. What's coming next for you? "Say Hello to the Bad Guys," a show with Sam Losco [which will have] gigs in very near future.